Embryonic stem cells have the ability to develop into virtually any cell in the body, and may have the potential to treat medical conditions such as diabetes and Parkinson's disease. 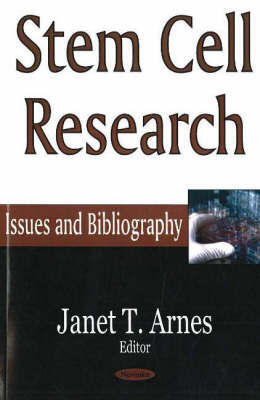 In August 2001, President Bush announced that for the first time federal funds would be used to support research on human embryonic stem cells, but funding would be limited to 'existing stem cell lines'. The National Institutes of Health (NIH) has established the Human Embryonic Stem Cell Registry which lists stem cell lines that are eligible for use in federally funded research. Although 78 cell lines are listed, 21 embryonic stem cell lines are currently available. Scientists are concerned about the quality, longevity, and availability of the eligible stem cell lines. For a variety of reasons, many believe research advancement requires new embryonic stem cell lines, and for certain applications, stem cells derived from cloned embryos may offer the best hope for progress in understanding and treating disease. A significant cohort of pro-life advocates support stem cell research; those opposed are concerned that the isolation of stem cells requires the destruction of embryos. Letters from Congress, one signed by 206 Members of the House and a second signed by 58 Senators, have been sent urging President Bush to expand the current federal policy concerning embryonic stem cell research. Some have argued that stem cell research be limited to adult stem cells obtained from tissues such as bone marrow. They argue that adult stem cells should be pursued instead of embryonic stem cells because they believe the derivation of stem cells from either embryos or aborted foetuses is ethically unacceptable. Other scientists believe adult stem cells should not be the sole target of research because of important scientific and technical limitations. Groups make ethical distinctions in the debate on how to proceed with stem cell research based upon embryo protection, relief of suffering, viability, the purpose and timing of embryo creation and destruction, donor consent, scientific alternatives, federal funding, and cloning. Other countries are moving fast with active research programs. This book presents the current confused situation along with a selective bibliography.